So says Chris Horlacher (www.MapleLeafMetals.ca) in edited excerpts from his original article*. A 3% agent’s fee which means that for every $100 invested in the ETR $97 is used to purchase gold and $3 is handed over to the banks and brokerages as their commission for making a successful sale. A 0.35% per annum storage fee which means that for every year you own the ETR, the amount of gold your $100 investment represents is reduced by $0.35. The storage fee bears further scrutiny because of the way it works. Every year, the Mint will sell 0.35% of the gold stored under the ETR program in order to collect the fee. This means that over time, the amount of actual gold each ETR represents will steadily deteriorate. The longer the program operates, the greater the reduction in gold backing behind each ETR. A 5% redemption fees if you redeem your ETR for cash. An additional $1/ozt. redemption fee if you redeem for 400 oz bars (which drops to $0.25/oz after 10,000 oz’s). 400 ozt. bars: 0.333% equivalent [vs. 8.3%] based on our $5.50/ozt fee [and a selling price of $1,650 per troy ounce for gold. As said above, the higher the price of gold goes the lower our fee becomes on a percentage basis]. The Mint’s ETR: must redeem a minimum of 10,000 units in order to be eligible to receive physical gold. At an initial offering price of $20/ETR this means that you have to have at least $200,000 invested before you would ever see any physical gold from this program. Anything less is paid out in cash. Other funds are no better. Sprott Physical Gold Trust (PHYS): 400 ounces of gold. Some funds, like the Central Gold Trust (CEF), don’t let anyone redeem for physical gold at all! With as little as $1,000 invested with Maple Leaf Metals Exchange we will deliver your precious metals right to your door for a flat fee of $30 plus a 0.75% insurance fee of the subtotal. We ship anywhere in North America via priority or overnight Fedex, UPS, USPS or Canada Post and each discreet package is fully insured by our blanket policy. You will also receive a tracking number with every shipment. If you opt to have Maple Leaf Metals Exchange store your bullion for you, we waive the shipping fee in lieu of a monthly storage fee. As we say, “Simple is good”. Many ETFs and ETRs, including the Mint’s ETR program, can be terminated at the counterparty’s discretion. At least with the Mint’s ETR if it terminates the program, holders will be given 90 day’s notice and the option of redeeming their ETR’s for gold. Many other programs simply allow the counterparty to declare force-majeure and pay out their unit holders in cash only. The Mint can, however, at their discretion suspend all redemptions of ETR’s for gold, so this, in effect, provides investors with little security that they will receive their gold in the event of severe market events or other issues that may very well arise in the future given the economic climate. We at Maple Leaf Metals Exchange (MLME) offer storage on a fully-allocated basis. Bars are numbered and registered in the name of the buyer and not held on our own balance sheet so there is no risk of loss to the investor in the event that MLME meets an untimely end. We are simply acting as your custodian. All bullion held in our allocated storage program is fully insured in the event of loss due to fire, theft or other risks. We use third-party, professional vaulting facilities throughout Canada and armored carriers provided by companies with a long-established reputation such as Brinks in order to ensure the soundness of our program. 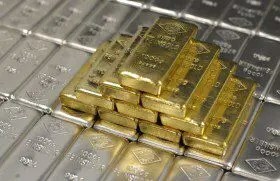 We believe that this is ultimately the best way for investors to purchase large quantities of bullion as they will benefit from a cost structure approximating the unallocated accounts and the greater level of security provided is a key feature that guarantees that the bullion will always be there when you need it. We can also arrange to have metals you already own delivered to our vaults from anywhere on earth. In an emergency, it is important to be able to access cash. This has meant the difference between life and death for many individuals and families during times of great economic and political turmoil. Investing in ETFs and ETRs can take weeks or months before you ever see any cash. Having physical precious metals either stored in a readily accessible vault or securely at home provides much greater liquidity because, not only can gold and silver be easily bartered with, but they can be converted to cash at a number of outlets in a matter of hours or minutes. While the Mint is a very respectable institution, as are a number of other issuers of gold and silver ETFs, trusts and other investment vehicles, even the best of institutions can fail during economic crises through no fault of their own. As such, we at Maple Leaf Metals Exchange feel that only possession is real protection in these volatile markets – and we offer lower costs, greater liquidity, the utmost security and unmatched convenience in accessing your physical precious metals to do just that. Why spend time surfing the internet looking for informative and well-written articles on the health of the economies of the U.S., Canada and Europe; the development and implications of the world’s financial crisis and the various investment opportunities that present themselves related to commodities (gold and silver in particular) and the stock market when we do it for you. We assess hundreds of articles every day, identify the best and then post edited excerpts of them to provide you with a fast and easy read. Sign-up for Automatic Receipt of Articles in your Inbox or via FACEBOOK | and/or TWITTER so as not to miss any of the best financial articles on the internet edited for clarity and brevity to ensure you a fast an easy read. 2. What Do Gold Measurements “Troy” Ounce and “Karat” Really Mean? Next IMF Begs Policymakers to Prevent World Economy From Falling into a 1930s-style Death Spiral!